Is Modern Gasoline Incompatible With Carburetors? Please Help! Thanks for the post, I was looking for the date last night and couldn't find it anywhere. It's a great show. I'll have my Pierce there if the weather is good. Next day is the 51st annual yankee chapter meet in Brooklyn Ct. Don't forget the Southbury Ct show on Sept 19 with over 1000 cars and lots of HCCA and CCCA as well as other pre war cars. Dave, The car should have a UU2 Stromberg on it. In 29 they had no air filter or spark arrestor, just a chrome pipe with a 45 degree angle on it and a blow by tube from the valve cover into the pipe. It should have the small type choke horn. If would not be uncommon to have the wrong carb on it, as most of the U series carbs fit smaller displacement engines and therefore they are not set up correctly for the Pierce. John Cislak is in the PAS and makes lots of parts for both the UU2 and UUR2, and he is just down the road from you. His number is 413-543-9017 in Springfield Mass. It would also help to rejet the carb for today's garbage type gas. If the car sat for a long time flushing the tank and fuel lines as well as rebuilding the fuel pump are also in order. It's Time To Start Thinking Hershey! It's been a great summer up here in New England, and it's hard to believe that the great fall meet will soon be upon us. My first was 39 years ago, when I was only five......... so many great memories of me and my departed father and grand father looking thorough piles of junk for 31 Cadillac parts...... in the knee deep mud...... it truly was searching for treasure...... Now I attend for social reasons as most of the CCCA car parts dried up, but still several time a day I come across a sleeper part and it takes me back to the good old days and if only for a moment........ it's like there still both there with me looking for the next great find........RIP Dad and Pepre'. My next project? 1921 Packard Coupe. 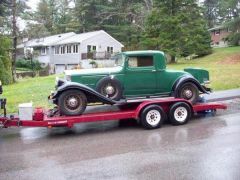 Bernie, If you want a little more of a project, check out this 36 Pierce that just came out of the Vermont woods.....:eek: Another EASY restoration. Of all the interesting people I have come across in the car hobby in the last 35 years, you are with out any doubt .... one of a kind! edinmass replied to Steve Hagy's topic in What is it? 1934 or 1935 from the looks of the grill. It's a truck body and fenders with what looks like a oversized car grill. Never have seen anything like it. It's very late for a Pierce truck. If memory serves me I have only seen photos of trucks up to 33. Very cool. This is a common problem. I'm a Pierce Arrow Society club member and we have a guy who is 6'5", and he has owned several 1932 and 1933 Pierce Club Brougham’s. They have huge doors and bucket style seats that can be easily moved back if you need too, but if I remember correctly, he fits just fine with them stock position. Interestingly, he told me he tried lots of other cars and could not drive them safely, as most of the cars have fixed seats. He was able to fit in my one off custom bodied 1933 Pierce LaBaron Limo with the huge front doors and 147 inch chassis, but that car is now in a large preeminent collection on the west coast, and that option tends to run into an expensive solution. Looks like 30-31 to me. If you do the math of a custom LaBaron body on a Ford stock or modified chassis, It makes no sense to spend the kind of money we are talking about to build this car without some type of Ford family or FMC relationship. The body lines are very fine, correct, and proportionate to the era. It's almost impossible even for a good "ally shop job" as Raymond H. Dietrich would say, to build a car to this quality. The more I look at the photos the more I think it's quite special. Here is some text taken from coachbuilt.com on Ford and LaBaron. I hope it's ok to use it here...... For the first year, Roberts commuted between Detroit and New York, but eventually moved full time to Detroit. A new studio was set up on the 4th and 5th floors of Briggs' Mack Avenue plant, called the LeBaron Studios, manned by Roberts and his staff of hand-picked designers. Roberts continued to work on the LeBaron series customs but also did work for Briggs production body division from time to time. He’s credited with the design of the Briggs’-built 1928-29 Ford Model A Fordor Sedan bodies. Apparently a Lincoln LeBaron sedan attracted the eye of Henry Ford who showed it to Walter O. Briggs proclaiming "Walter, there's our new Fordor sedan". The car was in dealer's showrooms in a remarkable six months and is easily distinguishable from Murray-built 1928-1929 4-door Model A's by its resemblance to the redesigned 1930 Model A four doors. LeBaron is also credited with the designs of all of the Briggs-built open bodies for the Ford Model A. Old Cars Weekly Price Guide Help! I thought the later cars like yours were 2 barrel. My guess is Carbking could give you better advice on a similar late 20's era single barrel. I have no doubt that the dual barrel manifold with a UUR2 would run like a dream. Was the 2 barrel stock on a 29 or a later style replacment? Peter, what is the box for? Hi Dave, We always drive it like we stole it! :eek: John and I spent the last two weeks sorting out the car. Next time I see you I'll let you take it for a spin. The 32 gearbox sure shifts great. Going to get a set of white walls and trim rings on it later this summer. Then we will paint the wheels a darker green than the body and get rid of the "S**T" brown colur.